We feel certain your membership in USPFA will provide you with confidence, new capability to achieve financial freedom & security, and information you can use to improve the quality of your life. If you are unsatisfied for any reason, let us know, and the unused portion of your membership fee will be returned to you immediately. There is no penalty for cancelling. We do ask that you email us to provide feedback about how we can improve for all members. If you would like to cancel your membership, please go to the "Members" tab to cancel at any time. If you are unhappy with a product within 30 days of purchase for any reason, please let us know, and we will refund your purchase price. 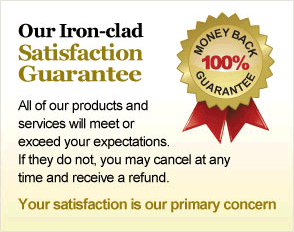 Simply call, email, or mail to make arrangements to return the product. We'll do the rest.